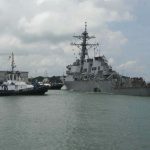 On August 21, the 183 meter long, 50760 dwt tanker Alnic MC collided with the 154 meter long, US Navy Destroyer USS John S. McCain in the Strait of Malacca off Singapore. 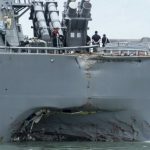 The Alnic MC’s bow struck the aft port side of the destroyer. 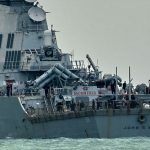 The Alnic MC sustained damage to its fore peak ballast tank while the USS John S. McCain suffered a hull breach with several compartments flooded including crew quarters, machinery and communications rooms. 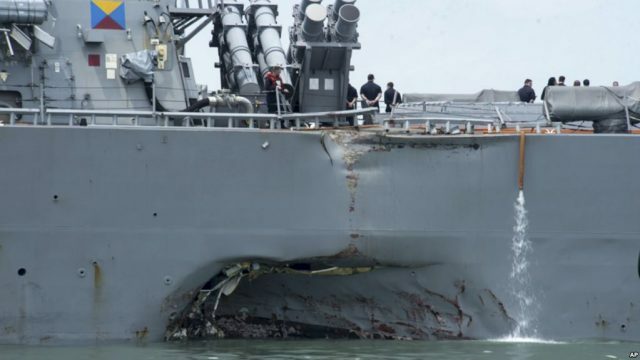 Five sailors were injured while another 10 were initially reported as missing on the destroyer. Later reports state many of the crew missing had become trapped in the flooded compartments. 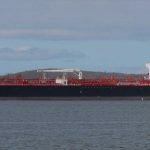 Both the Alnic MC and USS John S. McCain remained afloat and were able to proceed under their own power. Authorities have launched an investigation into the incident. The USS John S. McCain moored at the Changi naval base in Singapore.